Paint Tuscany with renowned instructor Samantha Williams-Chapelsky. Explore the Italian countryside and be inspired by the light, landscape, terrain and architecture. Students will learn to use bold and brilliant color to suggest subtleties within the landscape. By using acrylic paint, workshop participants will learn layering techniques as well as impasto techniques all with the use of water. Acrylic paint, revered for its portability and its quick drying application allows for students to develop of range of works on canvas that are nel momento, or in the moment. Students will master the “Paint Sketch” technique and will gain skills in quick methods of capturing space and time as Italy provides it. Samantha has worked as a visual art instructor for the past 8 years, specializing in acrylic and oil paint classes. 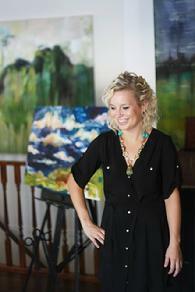 She is currently a member of the St. Albert Painters Guild, and the Visual Arts Studio Association of St. Albert. She is a trained GOLDEN artist educator and will be furthering her education with Golden in July of 2014 to become the working artist for Alberta. Samantha was nominated in 2012 and 2014 for the Lieutenant Governors Emerging Artist Award for the province of Alberta and has won the 2013 emerging artist Mayors Award in St. Albert. Samantha Williams-Chapelsky completed her Bachelor of Fine Arts Degree with distinction from the University of Alberta and completed her final year of this degree studying art and art history in Cortona, Italy. She has been exhibiting her art extensively for the past five years, participating in over 50 exhibitions including showings in Scotland, India, Italy, and New York. wine tours, horseback riding and more at extra cost! yet beautiful effects with acrylic paint. vibrant colors of the Tuscany region. Architecture and how to create depth in an acrylic painting. activities away from the hotel. or for any activities outside the above itinerary. Sketch book (8” x 11” or 5” x 6”) ideally thick enough paper to apply acrylic paint. ****Specific departure times from Florence airport and Cortona only; time to be announced. Group Meal Plan...CAD$4044.00 per person! CAD$3917.00 per person double occupancy w/Group Meal Plan!